"Hah!" He craned his neck, scanning the mob. He had witnessed something remarkable; it showed on his face. He grinned, still scanning. "You'll know" (p. 3). He's talking about the new girl. The new girl at Mica High is different. There's no other way to describe her. That's what Leo thinks. At first. She brings a pet rat to school, she wears weird things like kimonos and Indian buckskins, she brings a ukulele to school and sings "Happy Birthday" to people. She wears no makeup. And she calls herself "Stargirl." The students have never seen anyone like her before. Everyone loves her. She's not one of the beautiful ones, but still she becomes the most popular and beloved student at Mica High. And Leo finds himself in love. Not in love with the beautiful girl, or the smart girl, or the artist, or the actress. He loves Stargirl, not for her popularity but for her difference -- for who she is on the inside. Then she's turned on. Shunned. Hated for her differences. Like a new toy that first you love because it's fun and new, but then quickly get bored of, then ignore, then start to despise, the kids at the school start giving her the silent treatment. One of the "popular" girls threatens to drop her pet rat down the stairwell. But she doesn't let them get to her; she sill not let them make her feel bad. Leo, however, does feel bad. He is worried for her. He is also worried for himself -- what will others think of him for hanging out with her? (Classic teenage boy behavior, right?) He begs her to be "normal," to become like all the other girls. Blend in more; act like everyone else. For a little while, she does. This isn't the end. Will she return? And if so, in what form? Will she stay the way she has always been? Or will she stay "normal?" Stargirl celebrates the individuality of each and every person, all the while showing what happens when one person wants to be different, while the others want conformity. 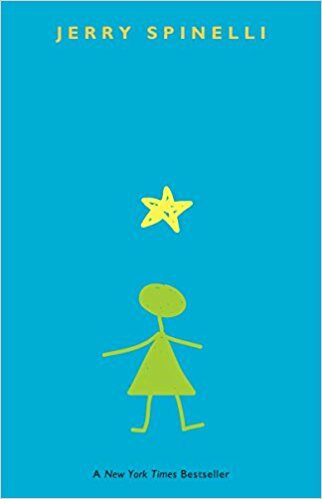 Stargirl would be a great read for 9+, for any kids -- especially girls -- who feel that pressure and don't know how to respond to it. Stargirl among the Mica High students is like a flower among the grass, or a cactus in the barren desert. Stargirl is the flower, she doesn't let the others steal her beauty. Not for long, anyway. Everyone talks about being normal, but when everyone is an individual, normal isn't a thing. Jerry Spinelli also wrote Wringer, which you can check out in my very first book review post, from over a year ago! Daddy’s afterthoughts: I don’t want to spoil the ending, but if you are familiar with Nathaniel Hawthorne’s “The Birthmark,” there are some parallels to the character of Georgianna. The arguably mad scientist Aylmer tries to use his alchemical wizardry to make his already remarkable wife Georgianna “perfect,” not realizing that when he succeeds, she becomes too good, too angel-like, to continue to exist on earth with the rest of us imperfect mortal fools, and so she is forced to depart. Perhaps, too, Steven King’s The Green Mile, in the character of John Coffey, who despite being misunderstood and even hated, gives his goodness to the world to the last, right up until he is executed for a crime he did not commit (whoops, spoilers). Even touches, perhaps, of Mary Poppins (the movie version of her, anyway), who comes, works her magic, and then, sensing the change in the winds, realizes it is time for her to go. Stargirl is a mysterious, inexplicable character who comes, and then goes, and leaves a legacy of memories. But is it just a legacy of memories? Or a legacy of memories and the accompanying lessons that leave the world a better place than when she first comes to town? Does her presence have a net positive impact on the community? And after she goes, does she stay away forever? This book is a glorious YA parable, and I would recommend it even for adults.